Something for Harry Potter fans as they wait for the release of the eighth and final movie, Harry Potter and the Deathly Hallows - Part 2 on the 14th of July. Do you have a favourite Harry Potter Character? 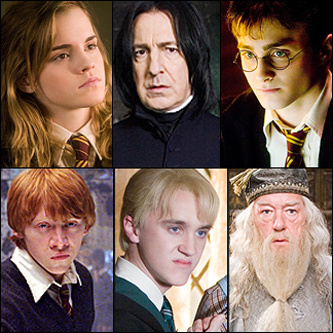 Bloomsbury, the publisher of the Harry Potter books, is asking Harry Potter Fans everywhere to vote for their favourite character and help decide who is the official Favourite Harry Potter Character. Voting closed on Friday 26th August 2011.
Who do you think the favourite will be? I can't help but think the favourite character will be Harry Potter .... but, it could be Professor Dumbledore .... or then again it might be Professor Snape .... Oh I don't know, I guess we'll just have to wait till 30th August to find out. I found out about the Favourite Harry Potter Character poll here too. Yes Meg, I will announce the winner on the blog. The poll finishes in two months - so I hope I don't forget. I think I might put a display up in the library - that will help to remind me and advertise the poll to everyone at school too.